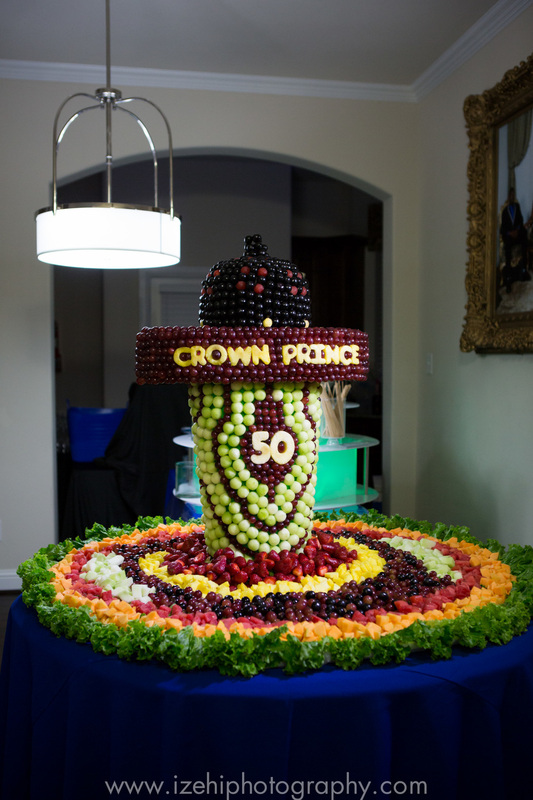 A 50th Birthday Party Fit for a Prince....literally! From the moment guests received the shimmering blue and gray invitations designed by Ijorere for Crown Prince Eddie’s 50th birthday bash, the tone was set. This would be a party fit for a prince. Nosa of Elegant Nuptials and Events brought in a team to transform an already upscale home with elegant hues of midnight blue and gray. Guests were chauffeured from an offsite location to the celebrant’s home in a luxury party bus. The red carpet was rolled out as the party goers walked through the front door. A white chocolate fountain and elaborate fruit arrangement drew guests to taste and nibble before the main meal. White tufted leather furniture and silver Chivari chairs invited guests to feel a bit like royalty themselves as they rested their feet from the dance floor in the backyard that felt like an upscale lounge. Gorgeous orchids, lilies, roses, and other white florals graced the interior and exterior of the home. You know what they say, it’s not a party without cake, and the talented hands of A Slice of Life Cakes created a masterpiece worthy of the occasion. Crown Prince Eddie and the family were regally dressed in custom apparel. While it was Dad’s birthday, this celebration was without a doubt a family affair, and everyone's clothing was on fleek (did I use that right??). The Prince’s damask designer suit, an Eaden Myles original, gleamed in silver and blue while his accessories: a blue bow tie, cane, and custom hat were eager to share in the spot light. Not to be outdone, the Princess looked positively FIERCE in her bespoke blue and gold dress, a Brides by NoNa creation. I dare say even a bride in her wedding gown would not have been able to compete with her glow. Staceface ensured the ladies’ faces were equally as glamorous as their dresses. Waiters kept the crowd eagerly salivating as they waltzed in and out with a dizzying array of delicate offerings including: lollipop chicken, jollof rice, coconut prawns, sliders, lettuce wraps, samosas, po-mo, and sooooo much more. Seriously, the food alone was worthy of it’s own blog post. I stopped counting after the 10th item was ushered out. I think it’s safe to say no one left hungry. And there wasn’t a reason for guests to leave thirsty either as the bartenders served up numerous glasses of the evening’s signature cocktail: the Eddie Royal. DJ Donx was on FIYAH!!! Well deserved compliments were showered on him all night long. He had guests unable to tear themselves from the dance floor as they whipped, Nae-Nae’d, chopped money, and of course did the Shoki dance. Whether in the middle of a packed dance floor, or alone for solo portraits, the way the Prince and Princess laughed and smiled at each other felt like a real life fairy tale! No doubt, there was an abundance for the senses to feast upon visually. However I think the most touching part of the evening was when the Prince’s family surprised him with thoughtful toasts and a video celebrating his life. There were very few dry eyes in the room. Prince Eddie & family, I am grateful to you for allowing me to document your celebration. Your love for each other inspired me. It was a joy to photograph you all. Cheers to more celebrations!